The year after the Civil War ended the parish of the Church of the Holy Sepulchre was established in the uptown area of Manhattan. In 1866 the concept of a “free” Episcopal church – one in which pews were not sold or rented – was still groundbreaking. Although the practice had started with the Church of the Holy Communion on 6th Avenue in 1846, it would be decades before the free worship was the norm. From its inception the Church of the Holy Sepulchre would be a free church. Architect James Renwick Jr., of Renwick and Sands, was commissioned to design the building in the sparsely settled area of East 74th Street off Madison Avenue. Renwick had already earned a national reputation with his designs for the beautiful Grace Church on Broadway and the Smithsonian Institution Building in Washington DC. 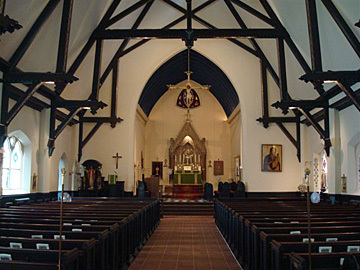 With deference to the semi-rural setting, Renwick turned away from his ornate and sophisticated Gothic Revival style seen in Grace Church and, instead, produced a charming fieldstone structure with brownstone trim with the feel of a country chapel. A brownstone course runs a few feet above from the ground, breaking its lineal progression to outline a lovely oval stained glass window. Two tri-part Gothic windows rest on this course, each joined by a rounded arch of variegated stone. The unassuming façade is dominated by a large central stained glass window under a small quatrefoil window. Inside Renwick continued the rural ambiance with exposed stenciled beam work with decorative finials and simple but attractive ceiling stenciling. On November 16, 1868 Bishop Potter – a major force in New York’s religious and social circles – laid the cornerstone a month after construction had commenced. The bishop’s ceremony was, according to The New York Times, “considerably more elaborate than is ordinarily witnessed at Episcopal occasions of the kind.” A long procession from the home of James B. Davis a block away included 14 clergymen, robed choirs from the churches of St. Chrysostom and St. Paul’s, a cross enveloped in white flowers and a contingent of dignitaries. Because there were no pew fees, a special collection was taken up to start relieving the $7000 debt of the new building. As the century progressed and New York’s wealthy built marble and limestone palaces along Fifth Avenue, the little church earned the nickname “The Servants’ Church” because of its location on the “wrong” side of Fourth Avenue – later to be renamed Park Avenue. Nevertheless, things were going well for the Church of the Holy Sepulcher until June of 1896. The 59-year old pastor, the Reverend Dr. Thomas P. Hughes, had led the parish for about eight years and had established himself as a leading figure in the religious community. His open-minded attitude led, for instance, to a series of lectures given in the building in 1894 on the religions of China and Japan. The high esteem with which he was regarded would come to an abrupt halt when he was accused of assaulting 15-year old Mary Glavek in his study in the church. After enticing the girl by requesting to see her schoolbooks and complimenting her on her Latin he “then asked her if she would not like to go with him to the seashore and bathe with him, and he pressed her to his breast and kissed her many times. Then he committed other improprieties and asked her if any one had ever before manifested affection for her,” according to The Times. The girl’s mother also alleged that Dr. Hughes tried to cover up the scandal by offering her $300 in $100 yearly installments. Although Dr. Hughes pled his case to the vestrymen in a letter, he was asked to leave. Astonishingly, Hughes remained steadfast until the parish paid him to resign. “We had to mortgage the property for an additional $5,000 to get money to pay…Rev. Dr. Thomas P. Hughes, not because we owed him, but because he would not get out unless we paid him that sum,” reported one vestryman. It would have seemed that the congregation’s troubles and scandal were finally over when the Reverend Walter E. Bentley replaced Hughes as rector. But that was before they discovered he was an actor. In the 1890s Bentley played leading parts on the stage before entering Bishop Huntington’s theological school in the Central New York diocese. After arriving at the Church of the Holy Sepulcre, the acting bug returned and he helped to found the Actors’ Church Alliance, built a small stage in the basement of the church and held regular meetings and rehearsals there. The vestry was not happy. “We needed a leader and a worker,” reported one vestryman, “Instead, we found we had in Mr. Bentley a man whose heart was on the stage and among actors. That work is all right, but it was not our work.” Rev. Bentley was asked to resign and did. Unfortunately, the problems of the two successive pastors resulted in a near failure of the parish. With the possible consolidation with another parish, the church was put up for sale and was threatened with demolition in 1903. Instead, however, the church supporters banded together to save the building and the congregation, which was shortly thereafter renamed The Church of the Resurrection. Sometime around 1920 a three story tower was erected on the east side and the open porch on the west side was enclosed as a vestibule. By this time the congregation was growing again, drawn by the parish’s strong Anglo-Catholic doctrine. In 2005 a campaign was begun to purchase and rebuild the 1916 Casavant pipe organ from the chapel of the Basilica of Saints Peter and Paul in Lewiston, Maine. The organ was dedicated in the spring of 2011. The lush liturgy that drew congregants in the 1920s, spoken in Tudor English and replete with ornate vestments, processions, incense and ritual endures today. 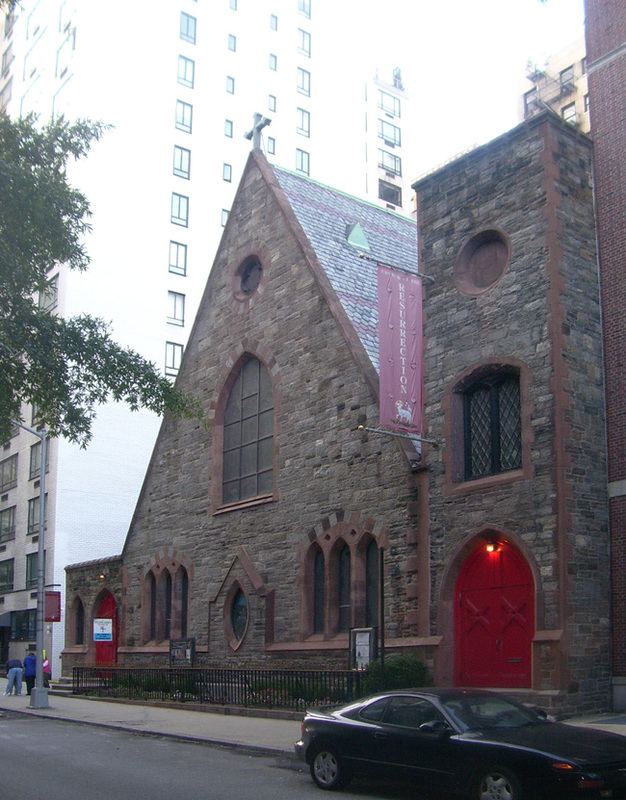 The church runs a Montessori preschool, the Resurrection Episcopal Day School, and continues to be a vital part of the Upper East Side neighborhood. Its delightful Renwick-designed building is an oft-overlooked jewel on East 74th Street.